When parishes agreed to meet the costs of medicines for the parish poor, they might require medical practitioners to submit an itemised bill for the raw materials, procedures and travel involved in delivering treatment. Many of the items were commonly known to contemporaries, but are less familiar to us: therefore when writers abbreviated entries for repeated supplies, they stored up a problem for twenty-first century readers. It is notoriously difficult (and perhaps unwise) to try to decipher the abbreviated Latin prescriptions of physicians. It is a little easier to understand the medical interventions involved when the original language was English, and/or the substances remain part of formal or informal treatments. National Portrait Gallery. 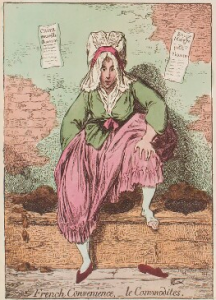 ‘National Conveniences’, James Gillray, 1796. NPG D13021. Dame Trill from East Hoathly had a problem we can recognise – she was constipated. We do not know the background to her story; she may have suffered a dietary deficiency of roughage or, if struggling with piles, she might have found relief in additional stool softener. Whatever the cause, the problem was stubborn. The parish bought senna and prunes for Dame Trill repeatedly 1770-4, usually at a cost of six and a half pence per treatment. Raisins were sometimes offered as an alternative to prunes. Other treatments issued to the sick poor were more general. The purpose of diuretic balsam is made clear in the name, in that it was designed to remedy the retention of urine, but the specific diagnosis is less easy to divine. Medicines for the poor at this date still relied on humoural understandings of the body for their rationale. Humoural medicine construed ill health as the imbalance of humours or fluids within the body. The four humours of blood, phlegm, black bile and yellow bile had a unique blend or balance for each individual, and the restoration of health demanded the removal of any humour that was overly prevalent. For this reason vomits, purges, diuretics and bleeding were among the most frequently used medicines throughout the eighteenth century. In addition to generic remedies there was a willingness by parishes to pay for the equivalent of brand-name medicines, known at the time as patent medicines. Widow Cane of East Hoathly was given Hooper’s Pills in 1773. The patent for this medicine was first issued in 1743 and was one of the most successful and long-lasting products of its type, being sold well into the twentieth century in England and elsewhere. It pledged to tackle female ‘irregularities’ and so was assumed by some customers to be a viable solution to an unwanted pregnancy. It is important to say, though, that we don’t automatically suppose that this was the purpose of the parish in buying the pills for Widow Cane! This medicine also offered to treat stomach problems, hysteria, and menstrual concerns: perhaps Widow Cane was menopausal? Lists of medicines and treatments for the parish poor have presented a problem to historians thus far: how are we to use them, if we cannot work out the ingredients of items listed simply as pills, powders or mixtures, and if the recipients are not always obvious? This is one of the problems this project is hoping to address. Do get in touch with the project team if you have any ideas about how we might use these intriguing vouchers to ask historical questions. Thomas Martin was a man of many parts. His early life is a mystery, but in 1781 he was married to Margaret Lowthian in Carlisle, and by 1787 was settled in the parish of Dalston. The couple had six children born in the parish up to 1802, at which point Margaret would have been aged approximately 45. The Dalston baptism registers give occasional occupational labels to fathers, and Thomas Martin gathered three different designations in a thirteen-year period. He was identified variously as a cotton manufacturer, a joiner, and a publican, but he is remembered for other skills as well. He was a salaried overseer for the parish in the 1810s, a workhouse manager in the 1820s, and he may well have had architectural credentials (perhaps in confirmation of his success as a joiner at scale). He was said to have been the supplier of plans for the first restoration of Dalston church in 1818. When writing his will, Martin identified himself as an innkeeper. It is interesting to note, though, the occupations of his children which also ran from the practical to the professional. Among his sons Richard was a warper (in the textile industry), while George was an innkeeper in Scotland; the son he didn’t mention in his will, Isaac, was a surgeon. This was a lower-middling family with aspirations to gentility, and numerous family skills. Even so, the next generation seems not to have lived long enough to capitalise on their father’s investment in this part of Cumberland. Sons Richard and Isaac both died in the 1830s (aged 48 and 43 respectively), and by 1890 there was no-one in the parish of Dalston named Martin. Sources: Carlisle marriage of 10 March 1781; Dalston parish registers, baptisms of 1 July 1787, 5 July 1789, 31 July 1791, 17 August 1794, 24 April 1797 and 1 January 1802; J. Wilson (ed. ), The Monumental Inscriptions of the Chruch, Churchyard and Cemetery of St Michael’s Dalson, Cumberland (Dalston, 1890), p. 101; Carlisle Archives PROB/1826/W246 will of Thomas Martin 1826; SPC 44/2/49 Dalston overseers’ of the poor vouchers, Thomas Martin legal accounts 6 February 1816-17 March 1817, and 18 October 1819 to 15 October 1821. Like many parishes in the second half of the eighteenth century, Ringmer had a small workhouse to accommodate the poor. Unlike many such houses, it has an interesting array of surviving sources, even before we start to unfold the overseers’ vouchers. The overseers’ accounts for Ringmer contain sporadic (if not consistent) evidence about the occupancy of the house and its layout/contents. The number of peepill/peapell in the workhouse in 1766, for example ranged from 17 to 34 inhabitants at any one time, always including a count of two for the master and mistress. An series of inventories surviving for 1790-1806 indicate the structure of the building, which was described as a poorhouse in 1790: at that date it had a governor’s room, Kitchen, back kitchen, brewhouse, bakehouse, pantry and storeroom, plus beds in a ‘chamber’ and in the ‘garret’. There were thirty occupants at the time suggesting there was little attempt to separate the inmates (men from women, adults from children) at this date. There is also evidence of the way in which the house was managed. In 1758 John Pring was a salaried master, paid thirty shillings per month for his custodianship in looking after the workhouse. This means that Pring did not have a personal interest in recruiting more workhouse poor, since he was paid a flat rate rather than per head of the pauper residents. By 1773, though, the parish had changed its approach to workhouse management. In that year the vestry made an agreement with Jos Peckham, a cordwainer, to keep the poor in the workhouse at the rate of two shillings six pence per head per week. From this sum Peckham was charged with feeding the poor, and washing or mending their clothes, but not with the purchase of new clothing. In additional recompense, Peckham could keep whatever earnings or benefit from the labour of the poor he could extract. This second sort of contract encouraged workhouse masters to fill their house to capacity, and find a form of productive work for the paupers to perform. We have no record yet of what the paupers thought of the masterships of either Pring or Peckham. Sources: The Keep, PAR 461/31/1-3, Ringmer overseers’ accounts 1754-1821; M. Diggle, ‘Ringmer Workhouse 1787-1806), Sussex History 1:8 (1979), 15-18. Recent research at Carlisle has revealed that, in addition to our first group of three target parishes, the Small Bills project will also be able to use overseers’ vouchers from additional places including Dalston. This means that, on a trip to Lady Gillford House earlier this month, I was drawn to the published volumes of the Dalston parish registers. The preface to the second volume of the registers includes a transcription of a document concerning the Dalston workhouse and its management by local man Thomas Martin. The workhouse contract was devised in 1822, but Martin had probably been managing aspects of parish business for some years by that time. He was the signatory to parish legal bills by 1816, and a full reading of the vouchers will probably reveal additional references to him. In the contract Martin offered (for a flat fee) to maintain all of the poor of the parish including illegitimate children, medical bills, apprenticeship costs, legal expenses and other forms of outlay for poor-relief. This was relatively unusual; parish contracts of this kind might relate exclusively to the workhouse poor, but less often encompassed the really pricey aspects of relief, like mending broken bones. But the quirky features of the Dalston contract keep coming. Martin also specified that he was emphatically not willing to collect the poor rates, or have anything to do with other parish responsibilities (associated with the Church, highways, valuations, vestry meetings – all of which he specified). The final and I suspect unprecedented aspect of the contract is that he undercut himself: the first agreement was signed on 13 June 1822 and netted Martin an income of £924 for twelve months of service, but by 20 June 1822 he was offering to do the work for £880! He had allowed the parish to revise the contract downwards, when they apparently asked to exclude two components: they were no longer paying up front for legal bills, and they were not prepared to pay him anything in addition to the contractual fee as a basic salary, hence the reduction by £44. If we assume the document of 13 June was legally valid, then the parish were depending on Martin’s good will in reducing his total fee. Sources: J. Wilson (ed.) Dalston Parish Registers volume 2 (1679-1812), xvii; Carlisle archives, SPC 44/2/49, Dalston parish legal bill for 6 February 1816 to 17 March 1817. Vouchers for the parish of Sandon contain a quantity of settlement examinations, the potted biographies of ordinary working people that chart their employment and rate-paying past. The examination of Jesse Harris taken on 24 August 1813 (exactly 205 years to the day before this blog post) offers a curious side-light on the working life of ostlers. Harris had been born in Cheadle, Staffordshire and was not apprenticed to any trade. Instead he made a living as a pot-boy and later as a ‘hostler’. In the latter capacity he took care of the horses belonging to the customers of an inn or coaching house, perhaps by feeding and rubbing them down, or seeing that they were accommodated in stabling suitable to their owner’s status. But the life and particularly the income of an ostler was a precarious one. Harris’s settlement examination refers to ‘the usual manner of hiring Hostlers, Viz to have board and lodging, no wages but such perquisites as the customers pleased to give him’. At the same time he had no fixed term of employment. Jesse Harris must have been reasonably adept at his job, however, as he held down the post of ostler at the White Hart in St Albans Hertfordshire for nearly six years before traveling back to Staffordshire.